Since we didn't really do much yesterday we had to fit quite a bit in to today. Yesterday we made reservations to go up the Petronas Towers at 6pm tonight so that was our one major deadline. 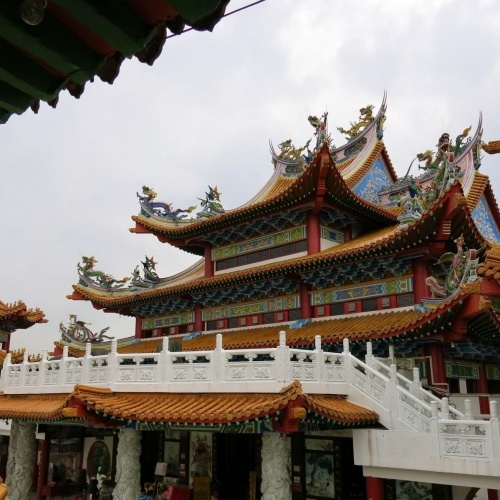 After waking up we went out to a street food market and got some food then walked over to visit the Thean Hou temple that was pretty close to our hotel. Unfortunately it had started to rain a little bit while we were walking over but it wasn't coming down hard enough to soak us. The temple was pretty cool but the one by the Big Buddah on Lantau Island in Hong Kong was a lot bigger. 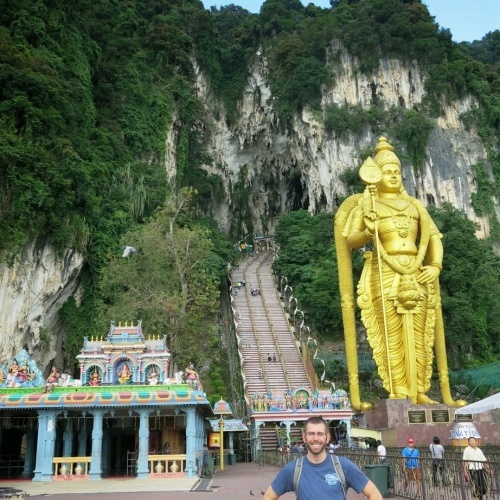 We took some photos and checked out the gift shop then headed back into town to catch the train up to Batu Caves. Batu Caves is at the end of one of the rail lines so it's very easy to get to. Once we stepped off the train we were thrown into a mix of hawkers, beggars and trash. The signage was nonexistent to the caves and we almost got sucked into some fake caves that a guy was trying to sell entry to. The whole area was filled with angry monkeys who would attack people for food or drinks and the actual entrance to the cave was up a huge flight of stairs filled with said monkeys. The caves were a pretty big letdown. The sheer amount of trash and monkeys around was too much. The "caves" were also filled with a bunch of rundown shrines and people trying to sell mini hindu god figurines. They were more along the lines of some large open caverns than actual caves. 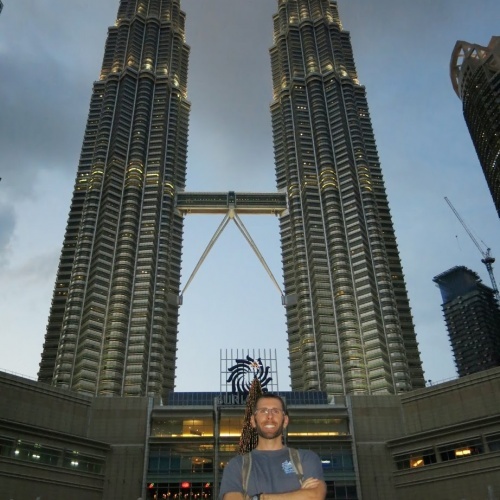 We didn't spend much time there and got back on the train to make our way to Petronas Towers. There wasn't really a good way to get over there so we had to take the train about half way and then walk for a while to catch the monorail line for a few stops to get closer to the towers. We checked in and got in line to go up the towers. The tour was about an hour long and took us up to the skybridge on the 40-something'th floor and then up to the 89th floor for the top level observation deck. Unfortunately Kuala Lumpur doesn't have a super spectacular skyline but it was still cool to see the city from so far up. The elevator runs inside the building so they put some flatscreen monitors on the walls and had a video running that imitates seeing the outside. Unfortunately the screens were old and the video wasn't very good so it almost caused some motion sickness since it was so choppy. When we got out it was the perfect time to see the towers from below. They had just lit up the towers so we hung out there for a while taking pictures before heading over to the Jalan Alor food street for our last Malaysian food experience. I got a bunch of skewers of meat and Mike got several plus a giant prawn. 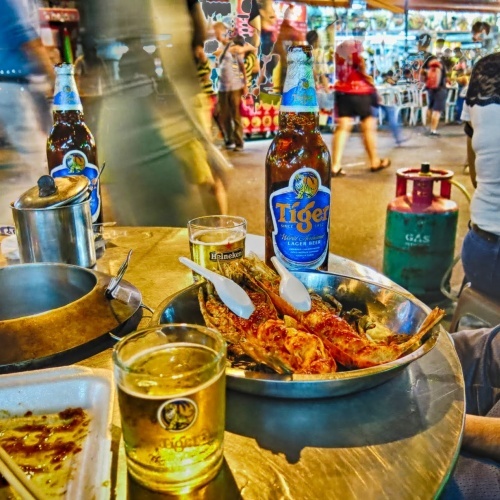 People watching while drinking some beers and eating good street food was a really good way to end our last night in Kuala Lumpur. Once we were done we hopped back on the monorail and came back to the hotel to get ready for heading to Singapore in the morning.